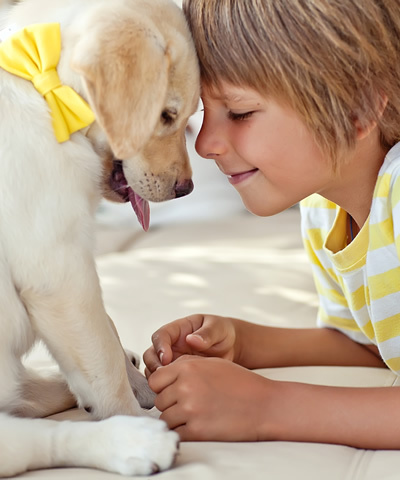 The benefits of raising children around a dog are numerous, providing an opportunity to teach them responsibility and compassion. However, due to a child’s small size and sometimes unpredictable behavior, it is vital for parents to understand and be aware of several things. This workshop seeks to make sure your pet co-exists peacefully with your child and the rest of your family. We will also examine common myths and misconceptions surrounding dogs and babies and children and we will evaluate your existing routines to ensure that you will be able to meet your dog's needs. Below is a listing of the current and upcoming Kids & Dogs workshops. Group classes require at least 6 attendees, please bring your dog. The price for each session is $40 (+HST). There are no refunds or make up workshops for not attending. There aren't any upcoming Kids & Dogs workshops. Please contact us if you’re interested. I cannot thank you enough for helping Sam get over his fear of dogs. It has truly changed our lives. Thank you so much for your kindness and patience. He now wants us to get a dog!!! !